So, last night it rained like crazy. I am here to visit the town of Urique, which is right down at the bottom of Copper Canyon and very far off the beaten track. 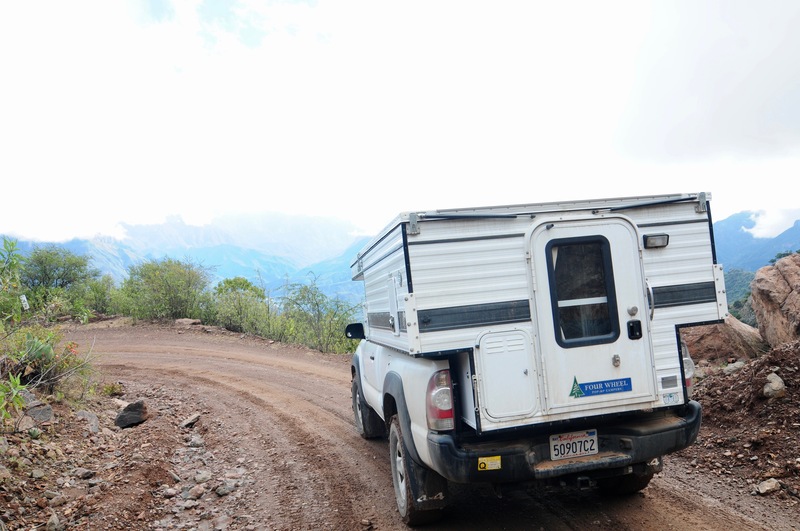 After many questions and much driving around the town where I stayed, I head off up the road to Urique. 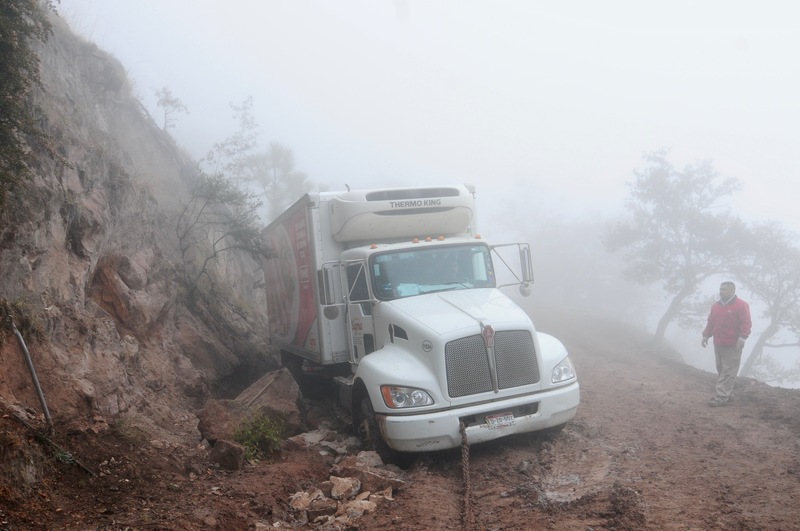 My understanding was that the road would go down to Urique, it being at the bottom of Copper Canyon. On the contrary it is a very steep grade that means staying in first or second gear. 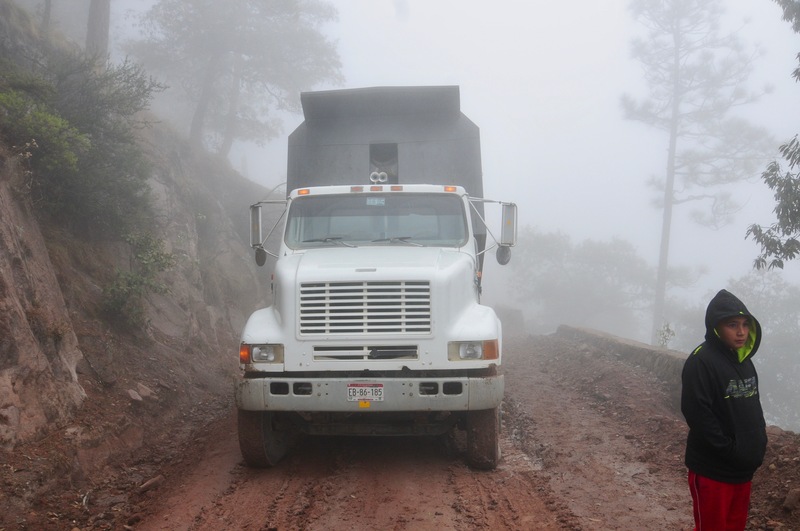 After a couple of kilometers the paved road changes into a muddy track and also becomes very narrow. The surface of the track, after all the rain, is slippery mud. Up and up for kilometers until I convince myself that I am on the wrong road, I mean we should be going down. At this point, a truck arrives coming the other way. The driver reassures me that I am on the right road and says I will love Urique; no mention of any potential difficulties. A bit further on the road is blocked by a truck that has slid into the ditch negotiating a fairly gentle bend. Frankly I am surprised it got this far. There are two guys and a Tarahumara woman with her son. 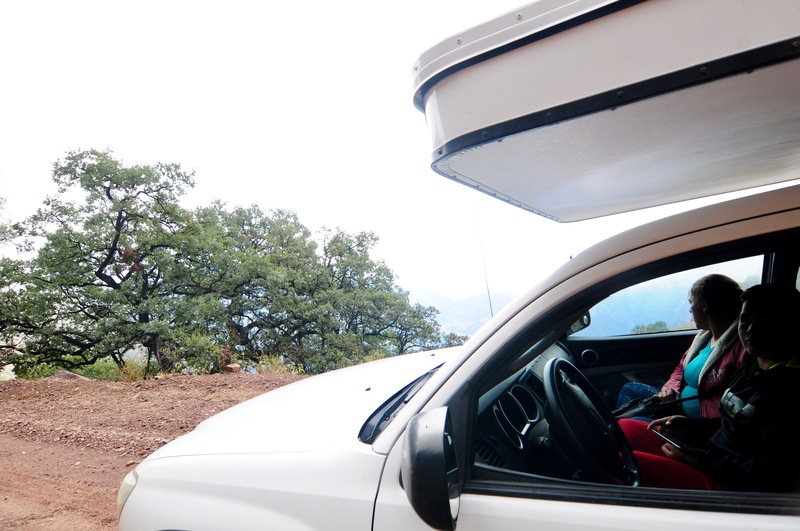 I manage to get around the truck and we make a few doomed attempts to haul the truck out with my baby Tacoma. My clutch begins to smoke alarmingly and my truck skitters sideways as it attempts to haul out its much larger cousin. We give up. I nearly end up in the ditch on the other side. 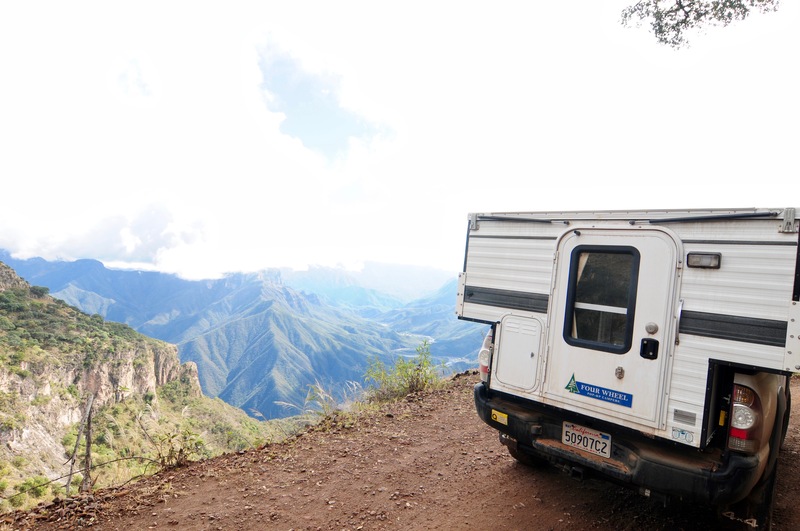 The Tarahumara folk ask if I can give them a ride to Urique. I make space on the bench seat but then they start unloading big crates of stuff from the stuck truck. We somehow manage to stow it all in the back of the camper and off we go again, still first and second up hairpins coated in greasy mud. Things get much worse as suddenly we enter the cloud layer. Visibility is awful. The prayers seem to work as the road starts to flatten out and is about a meter wider. Suddenly a policeman emerges from the cloud, fully equipped with submachine gun, and behind him are two huge trucks. Again, how the hell did they get here!? The first one is OK but the second is horribly stuck in the ditch. Everyone seems to be in a very good mood except me. I feel the time has come to try to turn around and get off this terrible road. 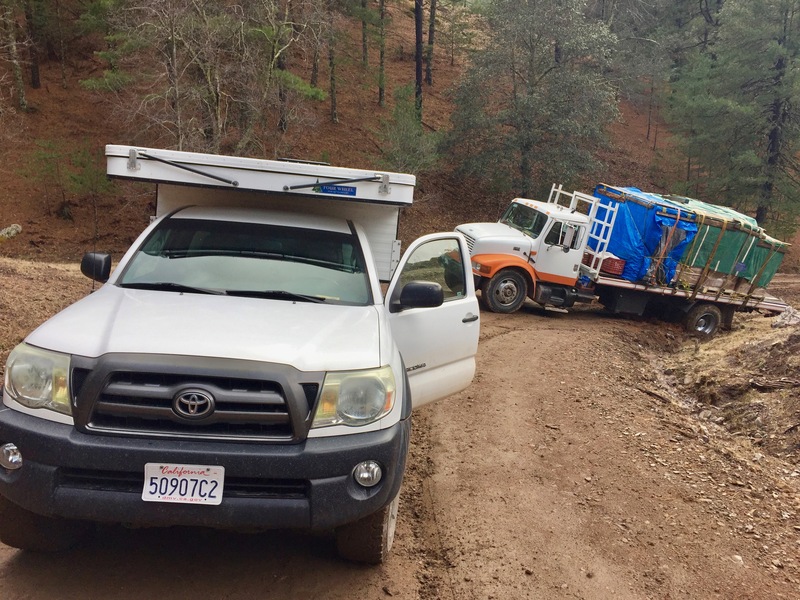 Of course, I cannot dump my Tarahumara friends and the truck drivers show me I can get by with at lest 30 centimeters to spare before my truck falls off the road and into the void. I hope I never have to do that again. Anyway the road is now downhill, which adds to the overall slipperiness of the voyage. It is first gear for 15 kilometers. Suddenly we burst out of the cloud and finally we can see, where we are and where we are going. The views are amazing as we hairpin it down the almost vertical mountain side to finally arrive in Urique. I am panting. I have never, ever been on such a crazy, scary drive. 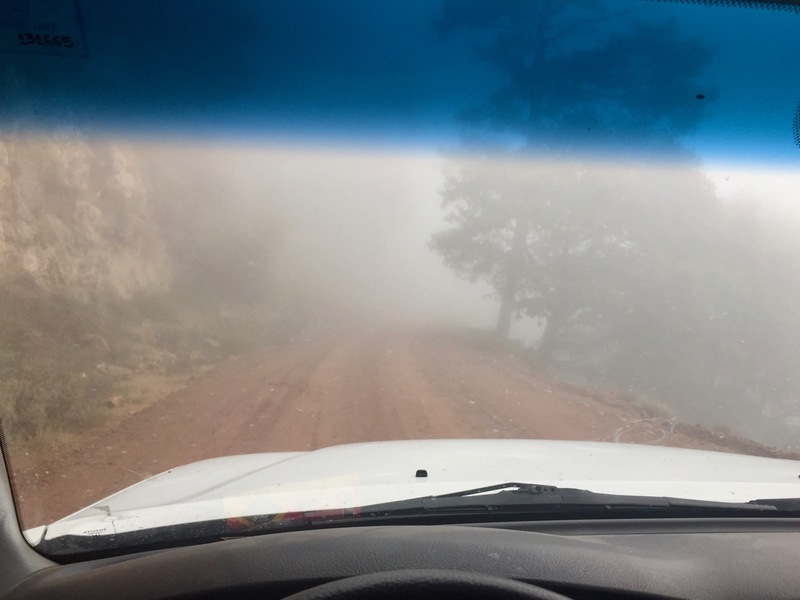 What amazes me is that none of the several people I asked for directions, nor the guy in the truck coming the other way, in any way intimated that this was a very freaky dirt road, deep in greasy mud, strewn with stuck trucks and very, very dangerous. I suppose it is their commute. 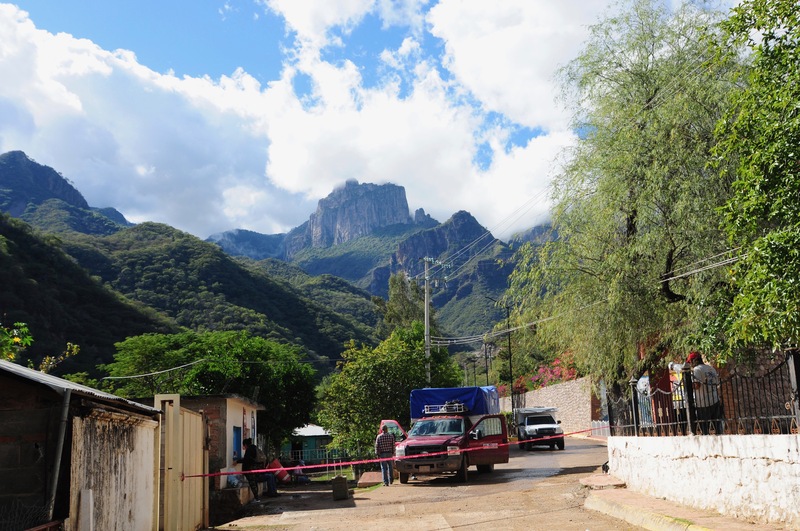 At Urique, there are people waiting and the Tarahumara folk disappear with no thank you. Again I do not think they felt there had been any drama, just another normal day. My passengers are completely unphased. 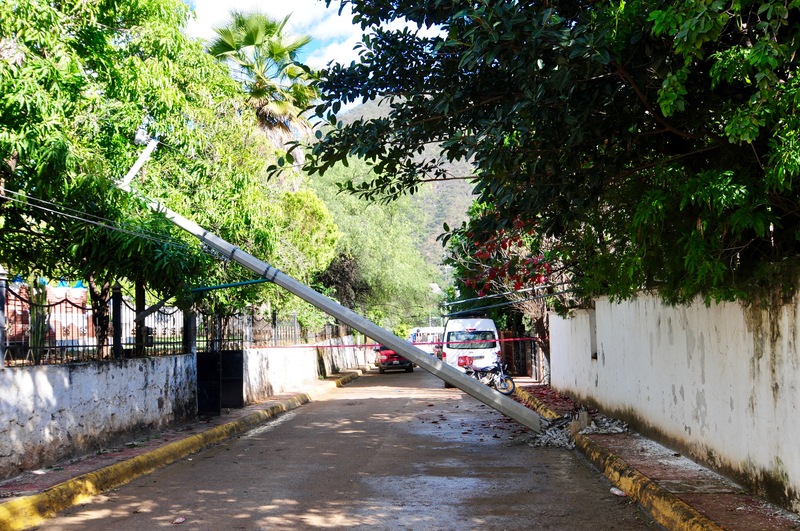 However the road into Urique is blocked, not by huge trucks, but by a power cable pole that has fallen, cutting off power to the town. There is no way in. I am writing this sitting by the roadside eating freshly roasted peanuts with truck drivers. It could be days before there is power again and I can send this from Ulrique’s Internet cafe. Nice place to wait. Spot the truck. I am in Mexico by the way.